Cathedral ceiling in large living area with comfortable seating. View out front window. Small conservation area across street. 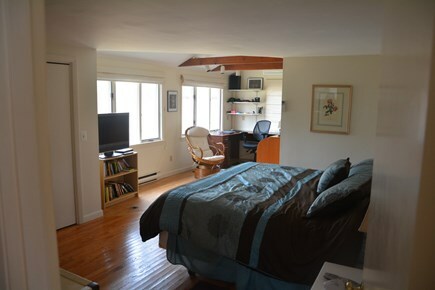 Master bedroom with study area in the back. Deck with patio furniture. Gas Grill at the side. Private backyard with storage shed for bikes, beach toys, etc. 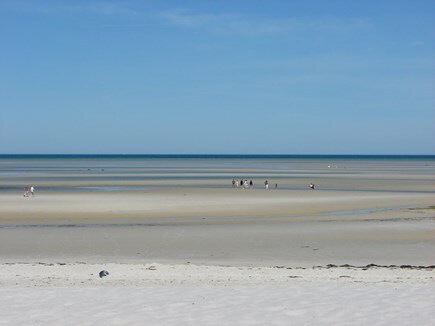 Beautiful Skaket Beach at low tide - just a mile away! 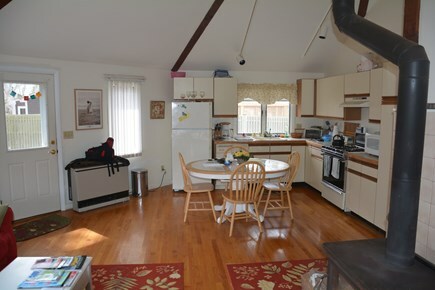 This 2 bedroom home is located on a quiet side street approximately 1 mile from Skaket Beach! Large HDTV in the living area complete with Cable, Wi-Fi, stereo, DVD player, and dozens of DVD movies. 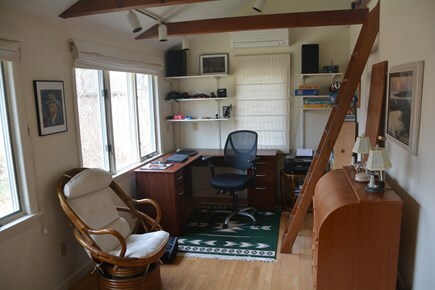 Mini-split AC units located in the cathedral ceilinged living area as well as in the master bedroom, which is complete with a king bed, a small study/work area, and small loft. 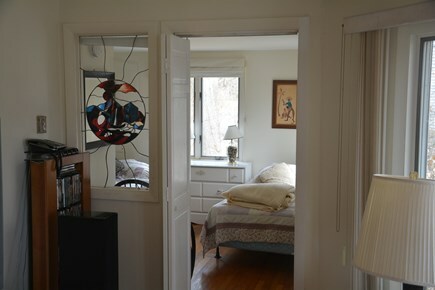 There is a 2nd bedroom with both a Full and a Twin bed. Home comfortably sleeps 4 or 5. There is a private yard with a shed in the back, a deck on the side of home with patio furniture, and an outdoor shower. 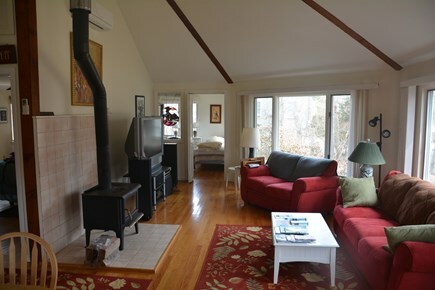 Easy access to Skaket Beach, town, bike trail and attractions. Very popular home with 75% repeat tenants! Additional availability info: Rental weeks are 3:00 pm Saturday to 10:00 am following Saturday. This is a Saturday to Saturday vacation rental. Additional pricing info: New Lodging Tax of 12.5% INCLUDED in rates listed. Discount for multiple weeks, State and local taxes of 12.45% will apply. I have owned and rented this home for approximately 20 years. I fell in love with the home and the area the very first time I saw it! I'm an avid cyclist so having the Cape Cod Rail Trail a mere .75 mile away is a BIG draw for me. (14 miles to Dennis and 12 to Wellfleet via the bike trail). 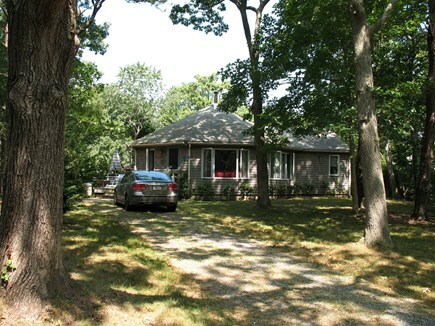 I rented numerous homes on the Cape before purchasing the home in Orleans. I have a good appreciation of what vacationers are looking for and am periodically updating the home, appliances, etc. The home is situated on a very quiet side street that is actually one big circle. So there is no through traffic once you get on this street. Even during the peak of summer the area is quiet. The walk to Skaket is very easy; there is a nice little cut-through one can use to gain access to a more private part of Skaket. (Walking only, no cars allowed on cut-through). I love the deck and privacy of the property in general. 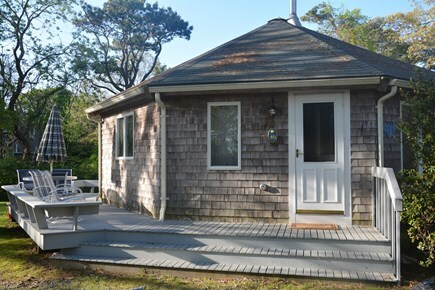 I have a very distant, TINY, view of Cape Cod Bay from the deck and kitchen window. 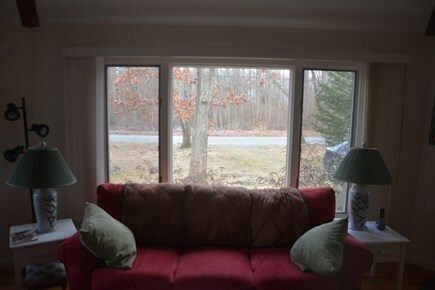 The home is very bright with large windows all around; rather unusual when compared to the typical Cape Cod home. I've cleared numerous trees on the front (south facing) side of the home so it is even brighter than it used to be. To sum up, the home is cozy, quiet, convenient, and very relaxing!!! Orleans has been described as the ''Jewel of Cape Cod''. 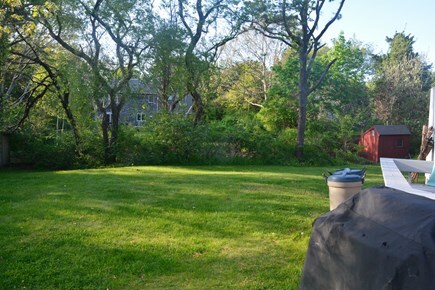 My quiet, secluded location within Orleans and proximity to Skaket and the Rail Trail make it quite idyllic. Besides Skaket and Nauset beaches, the town offers a number of fine restaurants, a small town center with stores, ice cream shops, library, several churches. Chatham center is approximately 10 miles away; Ptown is approximately 27 miles.